Want to know the secret to making perfect rice? 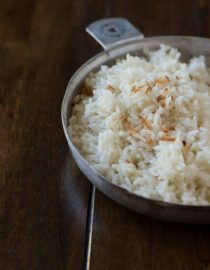 It all starts out in the saute pan and this Brazilian Coconut Rice is the most amazing side dish recipe to teach you! 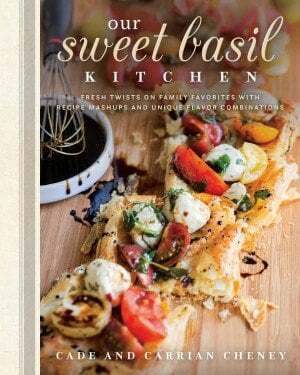 Our cookbook has this recipe in it and I have to say, if you haven’t bought Our Sweet Basil Kitchen Cookbook yet, now is TOTALLY the time!! And if you’re worried about your rice turning out, just click play to watch the whole thing happen. 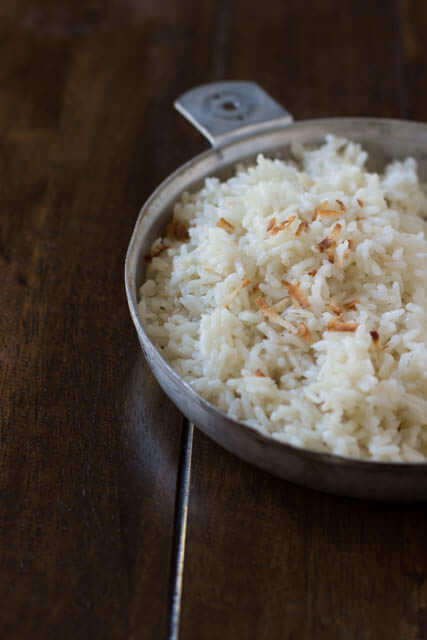 There are a lot of coconut rice recipes out there, and I believe that each are delicious for different reasons, but when you’re eating the best Hawaiian Luau Pork ever you kinda need the bestest Brazilian coconut rice ever too. And this recipe, well it’s the best if I do say so myself. And I’ll tell you a secret, it’s all about the method. My husband lived in Brazil serving a mission for 2 years, and their method of toasting the rice first is something that he immediately took to and now it’s how we cook our rice too. Plus, there’s brown sugar in there. Oh gosh, I loved brown sugar as a kid. It’s a little embarrassing to admit, but I’d totally snitch little pinches of the stuff while my mom was cooking or baking. She would always tell me to “get out of the brown sugar!” And now I’m an adult and she can’t tell me that. Haha, but seriously I do still take a little pinch whenever I’m using it. I can’t help it!! It’s just so darned delicious. This recipe is super easy so I wont bore you with a ton of talk, but basically you use the canned coconut milk, brown sugar and a pinch of salt. No water at all, but I promise it just makes for a creamy, sticky, flavorful rice. And if you want to get all cute you can toast a little coconut and sprinkle it on top. It’s not necessary to flavor though so don’t stress. 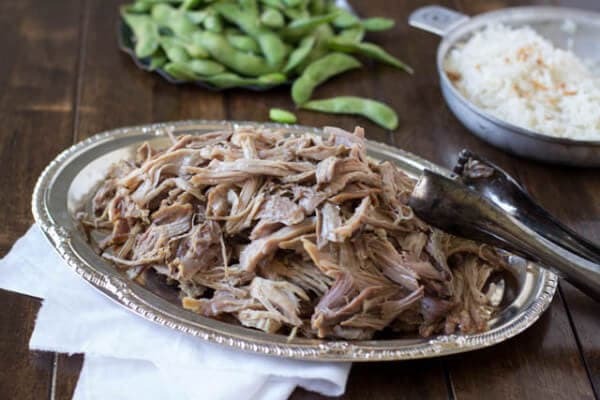 Just cook up that amazing pork that I just posted, this delicious rice, and if you watch my facebook page (which you should go like if you haven’t already so we can chat and share fun recipes etc) today I’ll post an easy edamame side to go with it. All varieties of rice are gluten free. Coconut milk is high in saturated fat, but it is also high in potassium which may lower blood pressure. Coconut milk is packed with vitamins C, E, B1, B3, B5, and B6 as well as iron, sodium, calcium, magnesium and phosphorus. What Can You Substitute For Brown Sugar? White sugar in an equal amount will work fine. Or, add 2 tablespoons molasses to every cup of substituted white sugar and you will not be able to tell the difference. In a large skillet add the butter and turn the heat to medium, add the rice and cook for 2 minutes, stirring frequently. 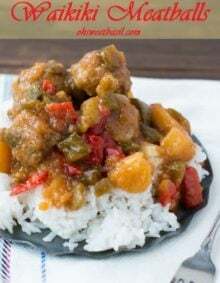 Place everything in a rice cooker and cook according to rice cooker instructions, or continue to cook in the pan on the stove, bring to a boil, turn down to a simmer and place the lid on for 20-30 minutes. I almost never write comments but this recipe is sooooo good! My hawaiian chicken wasn’t done yet and I just couldn’t stop picking at it. Even better with chicken. Thank you so much for sharing!! Isn’t it sooooo good?! We love it! So glad you enjoyed it! Is this unsweetened or sweetened coconut milk? This was tasty. If you’d like it sweeter, you can add chopped dates when you add the rice instead of adding more sugar. I served it with teriyaki chicken and stir fried veggies. Ohhh, I’ve never thought to add dates, but what a great idea! Wow this recipe is a keeper! Served it with Hawaiian Chicken and everyone loved it! 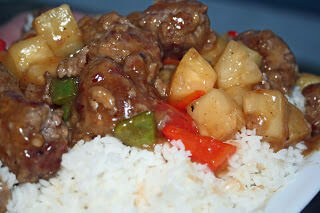 Truly a chef inspired recipe, better, so much better than takeout!! So nice of you Debra! Thank you! My experience from growing up with a Japanese family is that short grain rice is an equal parts cooking proposition, as in 2 cups rice to 2-1/2 cups water. I think 1 cup rice to 2 cups coconut milk would make it soupy like risotto. I want my rice to eat with a folk or chopsticks rather than a spoon. Barb, I’m so glad! Definitely one of our favorite sides! 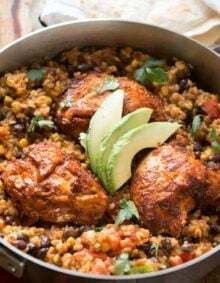 Hi, i love this recipe! I was just wondering, is it possible to use coconut oil to get the flavor instead of coconut milk? You could saute in coconut oil but the rice still needs to steam in water or coconut milk. Hope you enjoy! hi, I was wondering about which rice. I have minute rice at home, is that what you use? or regular rice? Yeppers, minute rice is not actually food. I am learning to be a better cook. I found your blog and we love trying your recipes, so thank you for sharing. We love the Hawaiian pulled pork recipe and for some reason our store didn’t carry pink salt but Red Hawaiian Sea Salt. I wonder if color makes a difference? Tonight, I finally made the pork along with this rice dish. After reading the comments, I cooked the rice with butter in skillet for about 5 minutes, then added everything into my rice cooker. Half way through I mixed it up too so nothing would burn or have a film. Once cooked it was a bit oily, I did buy a cheap can of coconut milk so maybe that is the cause. Oh and I did long grain rice…just wondering if cooking longer or not in a rice cooker would be best…? The red salt should be great. I’ve used it too. 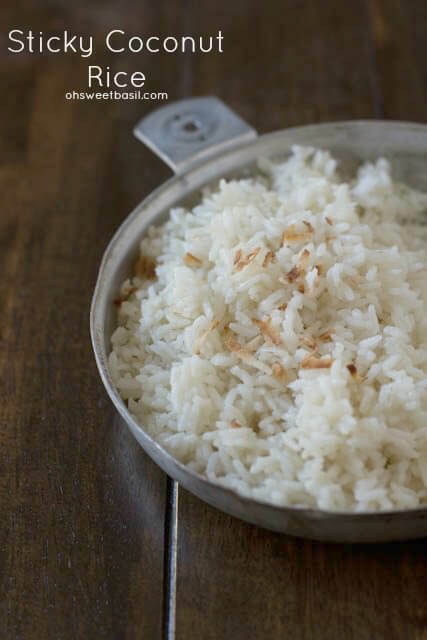 The rice will have a little sheen as the fat content for coconut milk is definitely different, but cooking it in the pan for long enough then just leave it alone so as much as the milk can cook into the rice as possible. I do agree, the cheaper the coconut milk the worse it seems to be. It takes a while to find good brands by you but Asian markets are my best bet for a good one. I have been playing around with different receipts online and this is the first one I found not using water along side the cocoanut milk. I tried it tonight and mine turned out very oily. The flavor was the and good I might add but where did I go wrong as far as the oiliness or is that just how it’s meant to be . Hmmm, ours has never turned out oily, but there are so many varieties of coconut milk and they are all so different it may have been that. Or it could be that the rice wasn’t cooked enough in the first stage so too much oil was left in the pan. Sorry, wish I was there to watch and help. Would love to try this with fruit. Could I add half coconut and half sweetened condensed milk to push it to the sweet side? Your thought greatly appreciated! Thank you so much for this recipe! It is refreshingly different, with the roasting technique and the brown sugar. Loved it! Aimee, I’m so glad you like it! It’s one of our favorites! Just tried it! It was really good. Not sweet enough to suit my family, but I thought it was perfect. Only problem I ran into was that I had a layer or film of coconut milk that settled on top, so it looked like it had more simmering to do than it actually did. I lost a decent bit of it to burning, but now I know what to watch out for next time. Ooh! I’ve had Thai coconut sticky rice but never Brazilian, to the best of my knowledge. This sounds (and looks) wonderful! I have been searching for a good coconut rice recipe! This looks and sounds wonderful. I have a rice cooker, but not recipe book…. Can’t wait to try! 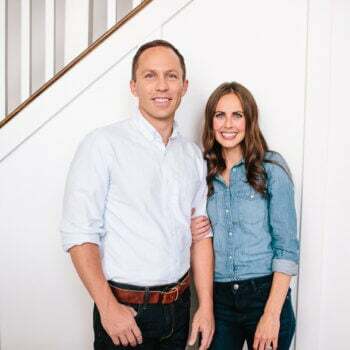 Where did your husband serve his mission? My son-in-law served in Sao Paulo South! Oh my! Coconut rice 🙂 this is fantastic, I love it! This looks so delicious! Love the different technique! COCONUT! Yes!!! This sounds so good! I am totally making this. Soon. I’m going to have to try a little brown sugar next time. It sounds great. brown sugar is probably one of my favorite things ever. Brought down the nutrition, but woooorth it! lol!!!! Best story ever!! And no, quiet is never ever a good thing unless they are asleep! I pretty much just want this for dinner. Yum! I actually made some pulled pork last night, thanks to your inspiration. May have to serve the leftovers tonight with this recipe! oh pork, gosh I love that stuff. 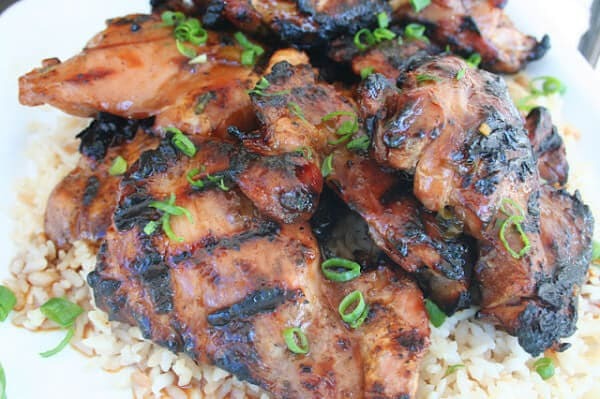 Such a yummy rice for the side of grilled meats, Carrian! 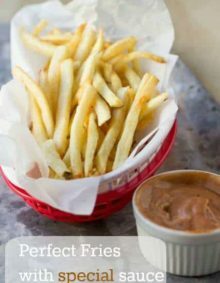 This looks perfect for summer meals! I absolutely cannot wait to try this rice! Yes, please! I need to cook more rice in our household and this is just the recipe to get me going! We usually only do brown rice, but this is just so good with white. I love coconut rice! It’s my dinner party rice for sure. If I’m doing a lot of really savory or spicy dishes in the meal I’ll throw in some golden raisins…yummy. This rice sounds delicious! I love toasting rice before adding the liquid. It takes on a nutty flavor. Yum! 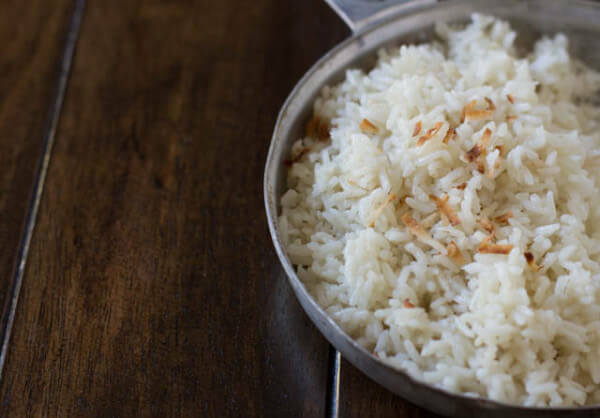 Oh heeeeeeeeeey brazilian coconut rice… you look GOOD! We eat tons of rice in our house and this is going into rotation ehem the rice cooker stat! That looks super easy, and really good. I think coconut rice is a good alternative for just everyday rice. Drooling over this – sounds so good!! Again, you and I are on the same page! I did coconut rice last night and posted Hawaiian and pineapple today. Sounds like we would both like to venture to Hawaii for a little bit! Okay, at least I would! I love your rice and that there is a little brown sugar in there. That sounds perfect!